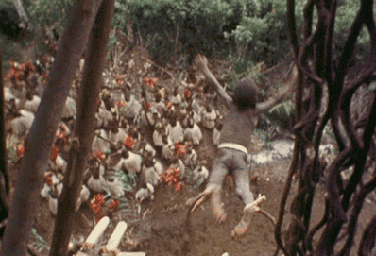 To ensure a good yam crop, men of Pentecost Island in Melanesia attach vines to their ankles and dive headlong from a wooden tower over 100 feet tall. Those who dive say the fall clears their mind. The vines are relatively elastic and the ground is softened so injury is rare. For Pentecost Islanders the annual dive takes an appropriate place among other rituals and ceremonies such as blessing the taro crop, circumcising young boys and feasting with relatives, all of which keep them in touch with the forces that control the world in which they live.